I have a hard time coming up with designs using individual letters so I'm excited to see all the entries to A Blog Named Hero Spell it Out Challenge. And I decided I should really play along. I used IO Funtime Large Letters to spell out "thanks." I wanted a large bold word embossed in black in the middle and a watercolor rainbow wash behind it. I couldn't decide if I wanted the butterflies clear embossed in the background or popped up on top so I did both. Which one do you like better? A Blog Named Hero Spell it Out Challenge. 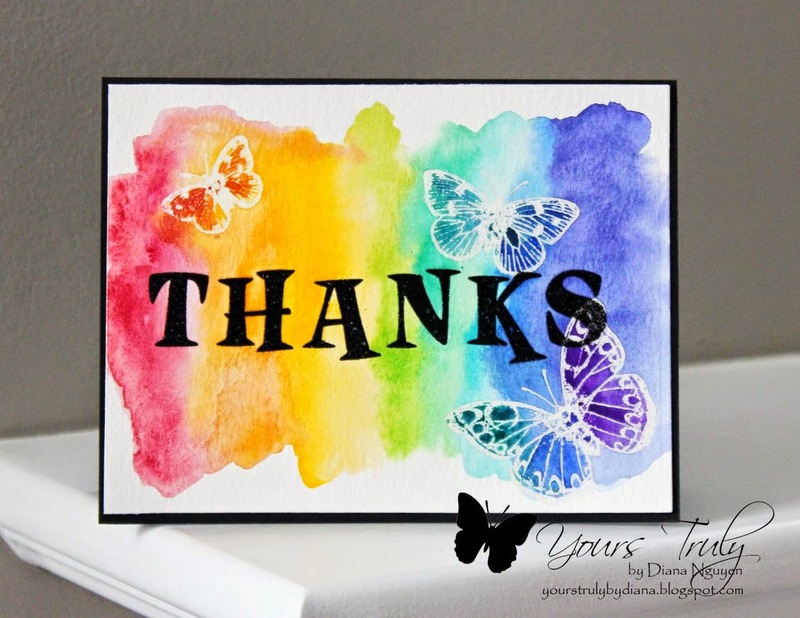 Fabulous cards Diana, wonderful background with a stunning rainbow of colours.....I love the embossed butterflies - so pretty and dainty. Wow, Diana! I absolutely love your watercolor background! So beautifully done! Thanks so much for playing Simon Says Stamp Wednesday Create Your Own Background Challenge!